Nairobi, Kenya. The conclusion of UNEA-4 saw a landmark resolution to promote gender equality and the human rights and empowerment of women and girls in environmental governance. The Women’s Major Group welcomes the commitment to strengthen the gender dimension of environmental policy and the resolution’s recognition of the importance of protecting human rights. We are particularly pleased that the resolution specifically invites member states to establish gender criteria for national environmental projects and programs, to recognize gender equality and the role of women and girls as sustainability change agents, and to support capacity-building to enhance women’s active and meaningful participation in decision-making. 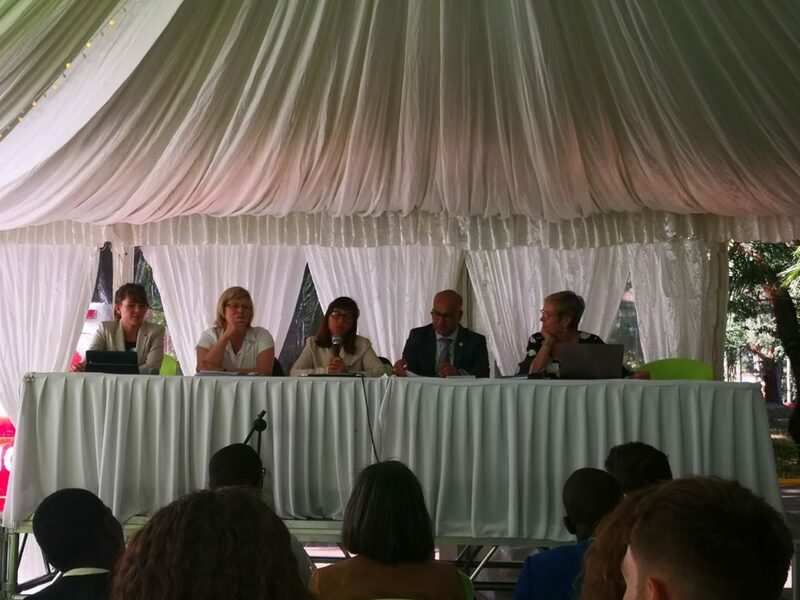 We welcome the mobilization of data requested of the UNEA Executive Director, but caution that this work must include access to information and participation by civil society and the Women’s Major Group, which is not currently stipulated in the text. As countries report back on their progress at the next UNEA meeting in 2021, we expect to see meaningful progress and accountability for their commitments made at UNEA-4. We regret that member states could not agree on the importance of protecting women human rights and environmental defenders, despite this having been articulated throughout the negotiations. This formal recognition is long overdue. States must seize every opportunity, in UNEA and in other UN fora, including the Human Rights Council, Framework Convention on Climate Change, and the High-Level Political Forum, as a matter of urgency to protect environmental human rights defenders – including those who are women and indigenous peoples – and the right to a healthy environment. The persistent absence of this recognition undermines the vision and commitments otherwise agreed upon by member states, and UNEP’s 2018 environmental defender policy. We listened with extreme concern to the United States, in its closing remarks, as it refused to acknowledge any reference to the Convention on the Elimination of All Forms of Discrimination against Women (CEDAW) in the adopted resolution. The CEDAW is ratified by almost 190 UN Member States, with the exception of a few including the USA. Unfortunately, in the resolutions concerning deforestation, geoengineering, and plastic pollution, issues that negatively and disproportionately affect local communities and women, member states largely maintained business as usual with weak or no meaningful commitments. We are dismayed at other resolutions that would have called attention to the harmful practices that affect women’s health, livelihoods, and planet. We strongly appreciate the draft resolution put forward by the EU on deforestation and agricultural supply chains. The US and Brazil undermined the spirit of this effort throughout until the moment it was withdrawn. It is past time to acknowledge that agricultural expansion is responsible for around 80% of deforestation, of which one-third is internationally traded. A strong resolution on that topic would have demonstrated political will and leadership in halting deforestation by 2020 – a target which has already been agreed under the 2030 Agenda and Aichi Target 5. We are thus deeply disappointed by the lack of ambition and obstruction in the negotiations on this issue, and the resolution’s ultimate withdrawal. If we don’t commit and take actions to halt deforestation and forest degradation today, we will not be able to ensure food security because healthy ecosystems are the basis for sustainable agriculture. We are dismayed that due to strong resistance from a few high-emitting fossil producing countries, like the US and Saudi Arabia, UNEA-4 also lost a vital opportunity to reinforce precautionary global governance of geoengineering at the UN, building on existing moratoria in the Convention on Biological Diversity and London Convention/Protocol. A resolution on marine plastic litter proposed by Norway, Japan, and Sri Lanka proposed ambitious language to halt the plastic crisis by strengthening international governance, including the consideration of a new legally binding agreement. However, strong opposition led by the US delayed progress at the scale and urgency that the plastic pollution crisis requires. Similarly, a resolution on single-use plastics proposed by India was weakened. We join vocal proponents – like the Pacific Islands States, Philippines, and Malaysia – in urging countries to take meaningful action to address plastic pollution between now and UNEA-5. Women and people all over the world continue to suffer from the impacts of failed policies and lack of action in effectively tackling climate change, air, soil, and water pollution, and unsustainable consumption and production. At UNEA-4, we saw a continuation of business as usual. As feminists, we continue to advocate and interject our analysis for women and the planet. We will continue to call for the Right to a Healthy and Sustainable Environment.